One of the most common foods to cause allergies are peanuts. This is a difficult allergy for a child or adult to live with as peanuts are very common in many recipes and baking ingredients. Peanuts are a legume. Peanuts are not considered a nut, however, children with peanut allergy should be careful about consuming or handling tree nuts. This includes almonds, walnuts, macadamia nuts, cashews and pecans, among others. The type of protein in peanuts is similar to the type of protein in tree nuts. Peanut allergy is permanent. Unlike food allergies from milk, wheat and eggs that children often outgrow, peanut allergy is something a child must live with his or her entire life. What occurs during a peanut allergy reaction? If a child is allergic to peanuts or other nuts, the immune system will overreact to the proteins in the peanut. Instead of treating the proteins as nourishing, the immune system treats them as an infection or virus and will soon release chemicals and histamine to fight off the infection, or in this case, proteins from the peanuts. It is the chemicals and histamine that cause the more visible symptoms of an allergic reaction to peanuts and tree nuts. The chemicals can result in a child suffering from shortness of breath, coughing, stomach pains, vomiting, watery or itchy eyes, hives or an immediate drop in blood pressure. Sometimes peanut allergy can lead to a dangerous reaction that is called anaphylaxis. Anaphylaxis begins with some of the less severe types of reactions or symptoms listed above but then progresses to trouble breathing and perhaps even a loss of consciousness. If bad enough, anaphylaxis can be fatal. 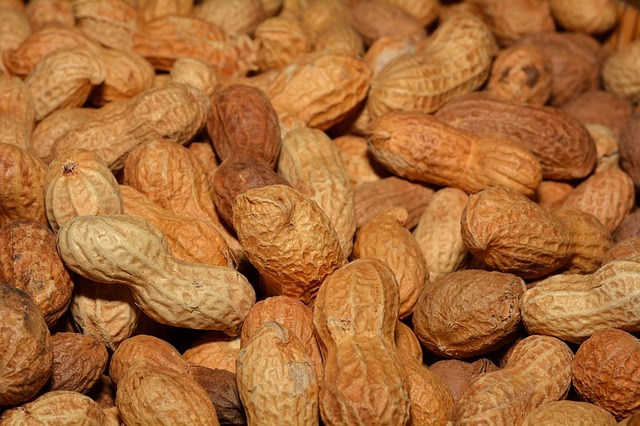 The most common cause of an allergic reaction to peanuts is from ingestion. Someone who suffers from peanut allergy will often ingest a peanut or traces of peanut proteins in baked goods or other recipes containing many ingredients. The other cause of an allergic reaction to peanuts is from handling peanuts or allowing the peanut protein to reach the surface of the skin. It is not common for someone to experience an allergic reaction from breathing in peanut proteins however it can occur if there is a lot of the peanut protein in the air in an enclosed area. Life-threatening cases of peanut allergy will require that you and your child carry epinephrine at all times. Epinephrine comes in various portable sizes. Your doctor should be able to show you how to properly use epinephrine in the event of a life-threatening allergic reaction to peanuts or nuts. In the event you do need to use epinephrine on your child, be sure to bring him or her to their doctor or an emergency care center immediately following the reaction as sometimes a secondary reaction will occur hours later if not properly treated. For more mild reactions, consider carrying an over-the-counter antihistamine product in order to curb the effect of the histamines released during the allergic reaction. You can use an antihistamine along with epinephrine but not in place of it if the reaction is severe enough. If you’re child is diagnosed with peanut allergy, your doctor will be able to provide helpful tips and some guidelines on parenting a child with peanut allergy. In general, you will need to ensure your child does not consume or ingest peanut proteins. The obvious solution is to no longer permit your child to eat peanuts or any type of nut, however, it goes further than that as several other foods contain peanuts and the proteins that can lead to an allergic reaction. The first thing to do before serving your child with the allergy any food is to read the ingredients on the labels of the food. Food manufacturers in the USA are required by law to advertise whether or not their product contains any nuts. If the food does contain nuts, do not allow your child to eat it. You want to be aware of these phrases in order to prevent cross-contamination from occurring. Cross-contamination is when peanuts or nuts from a nearby food or recipe end up coming into contact with an entirely different food or recipe in the same cooking or preparation space. You should avoid store-bought cookies or cookies and treats from bakeries in order to ensure that your child does not consume any nuts. Nuts are a very common ingredient in baked goods and in order to be 100% confident your child’s desserts do not contain any peanuts; you should consider baking them yourself. Only allow your child to eat candy made by well-known and large manufacturers. Smaller candy makers and bakeries might not be as diligent in listing all of the ingredients included in their candy or where the candy was made. Be careful purchasing ice cream from an ice cream parlor for any who has a peanut allergy. This is because the scoops and devices for serving the ice cream are used across several different containers and flavors of ice cream, some of which might contain peanuts or nuts. Instead, similar to candy, purchase ice cream from your local grocery store from larger companies that will list all of the ingredients and information about their product on the label. The most inconspicuous source of peanuts in food is in sauces. Chefs will use peanuts in their sauces in order to thicken the texture of the sauce. This results in peanuts being an ingredient in foods you would never imagine so you must be careful before serving your child anything with a sauce that you didn’t cook yourself. The general rule of thumb is to be cautious before eating or preparing any meal for your child. Continue to read the labels of all food each time you purchase it as the manufacturer could change the ingredients or the manufacturing process where the potential for cross-contamination could occur. Cross-contamination can occur from almost any surface in a kitchen or food preparation area. Be careful of knives or cutting boards where you or another member of your family might have prepared a peanut butter sandwich or another meal that did contain peanuts. If possible, try to limit peanuts and other nuts in your home as much as you can. Prepare your child’s lunches yourself. Do not order hot lunch or meals provided from your child’s school. Inform other parents and family members of your child’s peanut allergy if your child will be eating a snack or a meal in their home. Dine at restaurants that are willing to provide the complete list of ingredients for the meals on their menu. Keep epinephrine and other necessary medications on you at all time. Store them in your purse or pocket as well as in your car and in various areas throughout your home so access is instant. Peanut allergy is becoming more common and well-known in the USA to where businesses and restaurants are aware of the issue and as such are altering their manufacturing process and ingredients in order to accommodate those that suffer from the allergy. To parent and care for a child with peanut allergy, it will require diligence and attentiveness concerning the food your child eats and where he or she eats throughout their childhood but with the proper information and help from friends and family, peanut allergy is manageable and will not hinder the growth or development of your child in any way. *Cornerstone Academy and our daycare Kenosha facility and staff is able to handle and manage peanut allergy for children in our care. Please inform our staff if your child does have peanut allergy in order for us to put the proper preparations in place.